In January 2019, Just-Style consulted a panel of industry leaders and scholars in its Outlook 2019–Apparel Industry Issues in the Year Ahead management briefing. Below is my contribution to the report. Any comments and suggestions are more than welcome! 1: What do you see as the biggest challenges – and opportunities – facing the apparel industry in 2019, and why? In my view, uncertainty will remain the single biggest challenge facing the apparel industry in 2019, ranging from a more volatile global economy, the unpredictable outlook of the U.S.-China trade talks to the various possible scenarios of Brexit. While uncertainty creates exciting new research opportunities for scholars like me, it could be a big headache for companies seeking a foreseeable market environment to guide their future business plan and investments. Meanwhile, the increasing digitalization of the apparel supply chain based on big-data tools and artificial intelligence (AI) technologies means a huge opportunity for fashion companies. Indeed, the apparel industry is quickly changing in nature—becoming ever more globalized, supply-chain based, technology-intensive and data-driven. Take talent recruitment as an example. In the 2018 US Fashion Industry Benchmarking Study, which I conducted in collaboration with the US Fashion Industry Association (USFIA), as much as 68 percent of surveyed leading U.S. fashion brands and apparel retailers say they plan to increase hiring of data scientists in the next five years. Googling “apparel industry” together with terms such as “big data” and “data science” also returns much more results than in the past. It is hopeful that the advancement of digital technologies and the smarter use of data will enable apparel companies to overcome market uncertainties better and improve many aspects of their businesses such as speed to market, operational efficiency and even sustainability. 2: What’s happening with sourcing? How is the sourcing landscape likely to shift in 2019, and what can apparel firms and their suppliers do to stay ahead? First, apparel companies overall will continue to maintain a diverse sourcing base. For example, in a recent study, we examined the detailed sourcing portfolios of the 50 largest U.S.-based apparel companies ranked by the Apparel Magazine. Notably, on average these companies sourced from over 20 different countries or regions using more than 200 vendors in 2017. Similarly, in the 2018 US Fashion Industry Benchmarking Study, which I conducted in collaboration with the US Fashion Industry Association (USFIA), we also found companies with more than 1,000 employees typically source from more than ten different countries and regions. Since no sourcing destination is perfect, maintaining a relatively diverse sourcing base allows apparel companies to strike a balance among various sourcing factors ranging from cost, speed, flexibility, to risk management. Second, while apparel companies are actively seeking new sourcing bases, many of them are reducing either the number of countries they source from or the number of vendors they work with. According to our study, some apparel companies have been strategically reducing the number of sourcing facilities with the purpose of ensuring closer collaborations with their suppliers on social and environmental compliance issues. Some other companies are consolidating their sourcing base within certain regions to improve efficiency and maximize productivity in the supply chain. Related to this trend, it is interesting to note that approximately half of the 50 largest U.S. apparel companies report allocating more sourcing orders to their largest vendor in 2017 than three years ago. Third, nearshoring or onshoring will become more visible. Take “Made in the USA” apparel for example. According to the 2018 U.S. Fashion Industry Benchmarking Study, around 46 percent of surveyed U.S. fashion brands and apparel retailers report currently sourcing “Made in the USA” products, even though local sourcing typically only account for less than 10 percent of these companies’ total sourcing value or volume. In a recent study, we find that 94 out of the total 348 retailers (or 27 percent) sold “Made in the USA” apparel in the U.S. market between December 2017 and November 2018. These “Made in the USA” apparel items, in general, focus on fashion-oriented women’s wear, particularly in the categories of bottoms (such as skirts, jeans, and trousers), dresses, all-in-ones (such as playsuits and dungarees), swimwear and suits-sets. The advantage of proximity to the market, which makes speedy replenishment for in-season items possible, also allows retailers to price “Made in the USA” apparel substantially higher than imported ones and avoid offering deep discounts. Looking ahead, thanks to automation technology and consumers’ increasing demand for speed to market, I think nearshoring or onshoring, including ”Made in the USA” apparel, will continue to have its unique role to play in fashion brands and retailers’ merchandising and sourcing strategies. 3: What should apparel firms and their suppliers be doing now if they want to remain competitive further into the future? What will separate the winners from the losers? 2019 will be a year to test apparel companies’ resources, particularly in the sourcing area. For example, winners will be those companies that have built a sophisticated but nimble global sourcing network that can handle market uncertainties effectively. Likewise, companies that understand and leverage the evolving “rules of the game”, such as the apparel-specific rules of origin and tariff phase-out schedules of existing or newly-reached free trade agreements, will be able to control sourcing cost better and achieve higher profit margins. Given the heavy involvement of trade policy in apparel sourcing this year, companies with solid government relations should also enjoy unique competitive advantages. On the other hand, as apparel business is changing in nature, to stay competitive, apparel companies need to start investing the future. This includes but not limited to exploring new sourcing destinations, studying the changing consumer demographics, recruiting new talents with expertise in emerging areas, and adopting new technologies fitting for the digital age. 4: What keeps you awake at night? Is there anything else you think the apparel industry should be keeping a close eye on in the year ahead? Do you expect 2019 to be better than 2018, and why? First, what is the future of China as an apparel sourcing base? While external factors such as the U.S.-China tariff war have attracted most of the public attention, the genuine evolution of China’s textile and apparel industry is something even more critical to watch in the long run. From my observation, China is playing an increasingly important role as a textile supplier for apparel-exporting countries in Asia. For example, measured by value, 47 percent of Bangladesh’s textile imports came from China in 2017, up from 39 percent in 2005. Similar trends are seen in Cambodia (up from 30 percent to 65 percent), Vietnam (up from 23 percent to 50 percent), Pakistan (up from 32 percent to 71 percent), Malaysia (up from 25 percent to 54 percent), Indonesia (up from 28 percent to 46 percent), Philippines (up from 19 percent to 41 percent) and Sri Lanka (up from 15 percent to 39 percent) over the same time frame. A key question in my mind is how quickly China’s textile and apparel industry will continue to evolve and upgrade by following the paths of most other advanced economies in history. The newly-reached U.S.-Mexico-Canada Free Trade Agreement (USMCA or commonly called NAFTA2.0) includes several interesting changes to the textile and apparel specific rules of origin provisions, such as the adjustment of the tariff-preference level (TPL) mechanism. Whether these changes will boost textile and apparel production in the Western-Hemisphere and attract more sourcing from the region will be something interesting to watch. The implementation of the Comprehensive and Progressive Agreement of the Trans-Pacific Partnership (CPTPP) and the EU-Vietnam Free Trade Agreement (EVFTA) will allow Vietnam to get access to nearly 40% of the world apparel import market (i.e., EU + Japan) duty-free. However, restrained by the country’s relatively small population, the apparel industry is increasingly facing the challenge of competing for labor with other export-oriented sectors in Vietnam. Realistically, what is the growth potential of apparel “Made in Vietnam” after the implementation of CPTPP and EVFTA? In 2017, close to 80% of Asian countries’ textile imports came from other Asian countries, up from around 70% in the 2000s. Similarly, in 2017, 85.6% of Asian countries’ apparel imports also came from within the region. The negotiation of the Regional Comprehensive and Economic Partnership (RCEP) is likely to conclude in 2019, whose membership includes member states of the Association of Southeast Asian Nations (ASEAN) and other six economies in the Asia-Pacific region (Australia, China, India, Japan, South Korea and New Zealand). Will RCEP result in an ever more integrated Asia-based textile and apparel supply chain and make the Asia region even more competitive as an apparel sourcing destination? On October 16, 2018, the Trump Administration notified U.S. Congress its intention to negotiate the U.S.-EU Free Trade Agreement. Between 2013 and 2016, the United States and EU were also engaged in the negotiation of a comprehensive free trade agreement– Trans-Atlantic Trade and Investment Partnership (T-TIP) with the goal to unlock market access opportunities for businesses on both sides of the Atlantic through the ambitious elimination of trade and investment barriers as well as enhanced regulatory coherence. The T-TIP negotiation was stalled since 2017, although the Trump Administration has never officially announced to withdraw from the agreement. On January 11, 2019, the Office of the U.S. Trade Representative (USTR) released the negotiating objectives of the proposed U.S.-EU Free Trade Agreement after seeking inputs from the public. Overall, the proposed agreement aims to address both tariff and non-tariff barriers and to “achieve fairer, more balanced trade” between the two sides. Regarding textiles and apparel, USTR says it will secure duty-free access for U.S. textile and apparel products and seek to improve competitive opportunities for exports of U.S. textile and apparel products while taking into account U.S. import sensitivities” during the negotiation. The proposed U.S.-EU free trade agreement also will “establish origin procedures for the certification and verification of rules of origin that promote strong enforcement, including with respect to textiles.” T-TIP had adopted similar negotiating objectives for the textile and apparel sector. The National Council of Textile Organizations (NCTO), which represents the U.S. textile industry, hasn’t publically stated its position on the proposed U.S.-EU Free Trade Agreement. However, NCTO had strongly urged U.S. trade negotiators to adopt a yarn-forward rule of origin in T-TIP. NCTO also opposed opening the U.S. government procurement market protected by the Berry Amendment to EU companies. The United States and the EU are mutually important textile and apparel (T&A) trading partners. For example, the United States is EU’s largest extra-region export market for textiles, and EU’s fifth largest extra-region supplier of textiles in 2017 (Euratex, 2018). 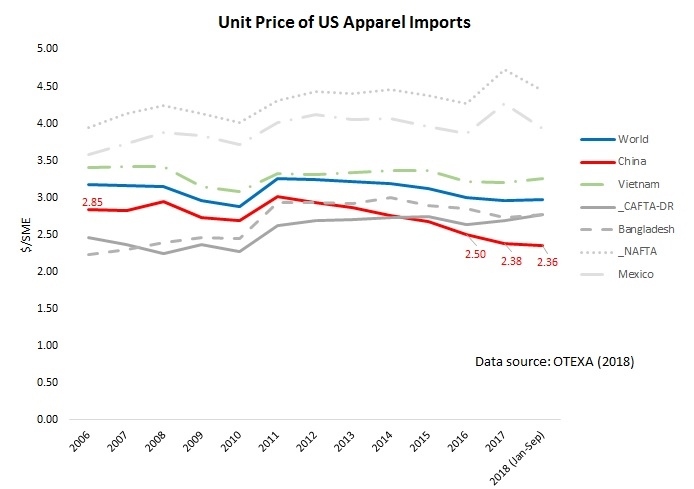 Meanwhile, the EU is one of the leading export markets for U.S.-made technical textiles as well as an important source of high-end apparel products for U.S. consumers (OTEXA, 2018). Specifically, in 2017, U.S. T&A exports to the European Union totaled $2,572 million, of which 73.2% were textile products, such as specialty & industrial fabrics, felts & other non-woven fabrics and filament yarns. In comparison, EU’s T&A exports to the United States totaled $4,163 million in 2017, among which textiles and apparel evenly accounted for 48.7% and 51.3% respectively. First, the trade creation effect of the agreement will expand the EU-U.S. intra-industry trade for textiles. Meanwhile, the agreement is likely to significantly expand EU’s apparel exports to the United States. Second, the trade diversion effect of the U.S.-EU Free Trade Agreement will affect other T&A exporters negatively, including Asia’s T&A exports to the U.S. market and EU and Turkey’s T&A exports to the EU market. Third, the U.S.-EU Textile and Apparel Trade might affect the intra-region T&A trade in the EU region negatively but in a limited way. Overall, the study suggests that the EU T&A industry will benefit from the additional market access opportunities created by the U.S.-EU Free Trade Agreement. One important factor is that the U.S. and EU T&A industries do not constitute a major competing relationship. For example, the United States is no longer a major apparel producer, and EU’s apparel exports to the United States fulfill U.S. consumers’ demand for high-end luxury products. The U.S.-EU Free Trade Agreement is also likely to create additional export opportunities for EU textile companies in the U.S. market, especially in the technical textiles area, which accounted for approximately 40% of EU’s total textile exports to the United States in 2017 measured in value. Compared with traditional yarns and fabrics for apparel making purposes, technical textiles are with a greater variety in usage, which allows EU companies to be able to differentiate products and find their niche in the U.S. market. Further, the study suggests that we shall pay more attention to the details of non-tariff barrier removal under the U.S.-EU Free Trade Agreement, which could result in bigger economic impacts than tariff elimination. Lu, S. (2017). Trans-Atlantic Trade and Investment Partnership: An Opportunity or a Threat to the EU Textile and Apparel Industry? Journal of the Textile Institute, 109 (7), 933-941. First, U.S. apparel companies overall adopt a diverse sourcing base. Among the 50 companies we examined, on average they sourced from over 20 different countries or regions using more than 200 vendors in 2017. These results echo the findings of the 2018 U.S. Fashion Industry Benchmarking Study released by the U.S. Fashion Industry Association (USFIA) in July. Based on a survey of nearly 30 executives from leading U.S. fashion brands and apparel retailers, the study also found companies with more than 1,000 employees typically source from more than ten different countries and regions. Also, larger companies, in general, adopt a more diverse sourcing base than smaller ones. Second, while U.S. apparel companies are actively seeking new sourcing bases, many of them are reducing either the number of countries they source from or the number of vendors they work with. Specifically, among the top 50 U.S. apparel companies examined, around 28 percent increased the number of countries or regions they use as sourcing bases between 2014 and 2017. However, over the same period, 52 percent chose to consolidate their existing sources base, but on a small scale. Likewise, among the top 50 U.S. apparel companies examined, approximately half reduced the number of vendors they use between 2014 and 2017, compared with 33 percent that chose to source from more vendors. Third, for risk control purposes, most U.S. apparel companies avoid relying too much on any single vendor; however, some companies have begun to allocate more sourcing orders to its largest vendors. The top 50 U.S. apparel companies we examined on average assigned no more than 10 percent of their total sourcing value or volumes to any single vendor in 2017. This practice suggests that minimizing supply chain risks is a critical consideration of U.S. apparel companies’ sourcing strategy. Nevertheless, between 2014 and 2017, around 45 percent of apparel companies we examined raised the cap slightly. Fourth, regarding the financial implications of the adjustment of sourcing strategies, companies that diversified their sourcing bases between 2014 and 2017, in general, were able to reduce sourcing cost and improve gross margin. 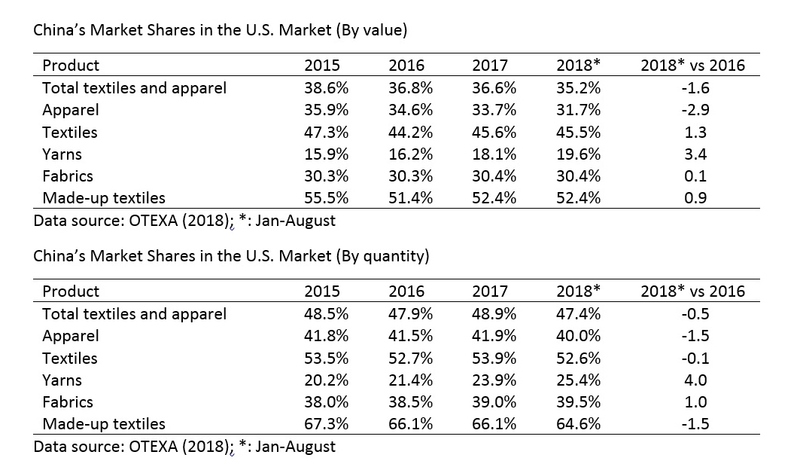 In comparison, U.S. apparel companies we examined that consolidated their sourcing base between 2014 and 2017 suffered a slight decline in their gross margin percentage. On the other hand, however, there was no clear pattern between a company’s choice of sourcing strategy and their net profit margin. While multiple factors could come into play, one possible explanation for the results is that that either diversifying or considering the sourcing base would incur additional management cost for the company. What Do You Take Away from FASH455? I encourage everyone to watch the video above, which provides an excellent wrap-up for FASH455 and reminds us of the meaning and significance of our course. The names of several experts featured in the video should sound familiar to you, including David Spooner (former U.S. Chief Textile Negotiator and Assistant Secretary of Commerce), Julia Hughes (president of the US Fashion Industry Association, USFIA) and Auggie Tantillo (president of the National Council of TextileOrganizations, NCTO). First of all, I hope students can take away essential knowledge about textile and apparel (T&A)trade & sourcing from FASH455. As you may recall from the video, in FASH455, we’ve examined the phenomenon of globalization and its profound social, economic and political implications. We also discussed various trade theories and the general evolution pattern of a country’s T&A industry and its close relationship with that country’s overall industrialization process. We further explored three primary T&A supply chains in the world (namely the Western-Hemisphere supply chain, the flying geese model in Asia or “factory Asia” and the phenomenon of intra-region T&A trade in Europe). Last but not least, we looked at trade policies that are unique to the T&A sector (e.g.,: the quota system, and the yarn-forward rules of origin) as well as the complicated factors behind the making of these trade policies. No matter your dream job is to be a fashion designer, buyer, merchandiser, sourcing specialist or marketing analyst, understanding how trade and sourcing work will be highly relevant and beneficial to your future career given the global nature of today’s fashion industry. Second, I hope FASH455 helps students shape a big picture vision of the T&A industry in the 21st-century world economy and provides students a fresh new way of looking at the world. Throughout the semester, we’ve examined many critical, timely and pressing global agendas that are highly relevant to the T&A industry, from apparel companies’ social responsibility practices, the debate on the renegotiation of the North American Free Trade Agreement (NAFTA) and Trump Administration’s trade policy agenda to the controversy of second-hand clothing trade. It is critical to keep in mind that we wear more than just clothes: We also wear the global economy, international business, public policy and trade politics that make affordable, fashionable, and safe clothes possible and available for hardworking families. This is also the message from many of our distinguished guest speakers this semester, and I do hope you find these special learning events enlightening and inspiring. Likewise, I hopeFASH455 can put students into thinking the meaning of being a FASH major/minor(as well as a college graduate) and how to contribute to the world we are living today positively. A popular misconception is that T&A is just about “sewing,” “fashion magazine,” “shopping” and “Project Runway.” In fact, as one of the largest and most economically influential sectors in the world today, T&A industry plays a critical and unique role in creating jobs, promoting economic development, enhancing human development and reducing poverty. As we mentioned in the class, globally over 120 million people remain directly employed in the T&A industry, a good proportion of whom are females living in poor rural areas. For most developing countries, T&Ausually accounts for 70%–90% of their total merchandise exports and provide one of the very few opportunities for these countries to participate in globalization. Indeed, T&A is such an impactful sector, and we are as important as any other majors on the campus! How to make the growth of global textile and apparel trade more inclusive and equal? How to make sure tragedies like the Rana Plaza building collapse will never happen again? How will automation in apparel manufacturing change the future landscape of apparel sourcing? How to use trade policy as a tool to solve some tough global issues such as labor practices and environmental standard? Is inequality a problem caused by global trade? If global trade is the problem, what is the alternative? These questions have no good answers yet. But they are waiting for you, the young professional and the new generation of leaders, to write the history, based on your knowledge, wisdom, responsibility, courage, and creativity! So what do you take away from FASH455? Please feel free to share your thoughts and comments. Author Sheng LuPosted on November 26, 2018 December 5, 2018 Categories FASH455 course material, Free trade agreement and trade preference program, International economics and trade theory, International Trade, SourcingTags FASH455, Sourcing, supply chain, trade policy34 Comments on What Do You Take Away from FASH455? First, U.S. companies did NOT stop importing from China. 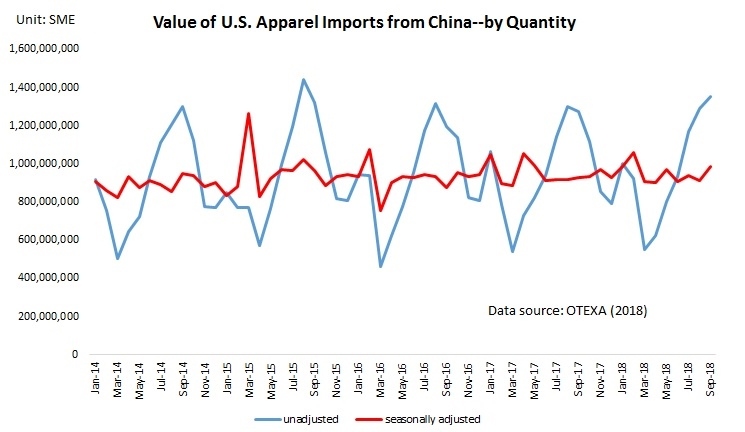 Seasonally adjusted data shows that between January and September 2018, the value of U.S. apparel imports from China decreased by 0.6 percent in volume and 0.05 percent in value year on year. Despite the decline, China remained the No.1 apparel supplier for the U.S. market in the first nine months of 2018, accounting for 32.3 percent market share in value and 41.3 percent shares in quantity, only marginally dropped by 1 and 0.7 percentage points from a year earlier respectively . Second, apparel “Made in China” are becoming even cheaper. Notably, the average unit price of U.S. apparel imports from China dropped from $2.5/SME in 2016,$2.38/SME in 2017 to $2.36/SME in the first nine months of 2018. On the one hand, this result suggests that cost concern is not the most influential factor that drives U.S. companies to source less from China. However, it is also likely that Chinese exporters are intentionally reducing their price to keep their orders and overcome the challenges caused by the Section 301. Third, there is no perfect replacement for “Made in China”. In response to the market uncertainty created by the Section 301 trade action, U.S. apparel importers are diversifying their sourcing base. That being said, it is difficult to identify a single largest beneficiary–notably, the market shares of apparel exports from Vietnam, Bangladesh, NAFTA, and CAFTA regions only marginally increased in the first nine months of 2018 compared with a year ago. Additionally, it remains unclear whether the section 301 trade action has benefited U.S. textile and apparel manufacturing. Data shows that in the first ten months of 2018, the production index (2012=100) of textile manufacturing in the United States slightly increased from 92.8 in 2017to 94.3. However, over the same period, the index of apparel manufacturing decreased from 73.6 to 72.4. Looking ahead, the volume of US textile and apparel imports from China is likely to increase in the short run since U.S. importers are eager to complete their sourcing orders before the new tariff hit. Usually, companies place sourcing orders several months ahead of the selling season. 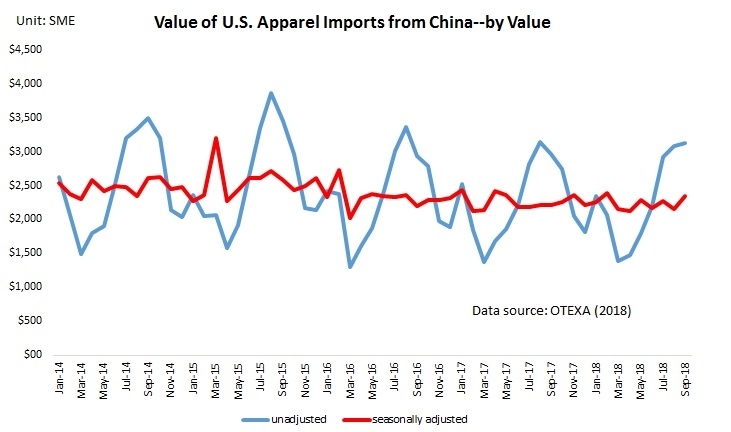 However, it will be interesting to see if the trade data in the first half of 2019 will reveal the negative impact of the Section 301 action on China’s apparel exports to the U.S. market. First, Canada is one of the largest and fastest growing apparel import markets in the world. Data from the UN Comtrade show that the value of Canada’s apparel imports totaled $10.7bn in 2017, which ranked the fifth in the world, only after the European Union (EU), the United States, Japan, and Hong Kong. Second, the Asian region as a whole is the dominant apparel supplier for Canada. Measured in value, as much as 80.9 percent of Canada’s apparel imports in 2017 came from Asia. Specifically, China (40.6 percent), Bangladesh (11.1 percent), Cambodia (8.1 percent) and Vietnam (7.7 percent) were the top individual supplier for Canada in 2017, and all of them are located in Asia. Meanwhile, Canadian apparel companies are gradually diversifying their sourcing base: the Herfindahl Index (HHI), a commonly adopted measure of market concentration, declined from 0.3 in 2010 to 0.19 in 2017. Third, the NAFTA-region remains an important apparel-sourcing base for Canada, but its overall influence is in decline. Measured in value, the United States and Mexico were the 6th and 9th top apparel supplier for Canada in 2017 respectively. However, facing the competition from Asia, the United States and Mexico combined accounted for only 6.4 percent of Canada’s apparel imports in 2017, a significant drop from 9.8 percent back in 2007. Fourth, free trade agreements and trade preference programs provide duty-saving opportunities for apparel sourcing in Canada. In 2017, Canada applied an average tariff rate of 17.1 percent on imports of knitted apparel (HS Chapter 61) and 15.9 percent on woven apparel (HS chapter 62). As of August 2018, Canada has 17 free trade agreements (FTAs) and trade preference programs (TPAs) in force, offering preferential or duty-free market access to Canada. Traditionally, a substantial portion of Canada’s FTA partners come from the Western Hemisphere, such as Chile, Costa Rica, Colombia, Peru, Honduras, and Panama. However, in recent years, Canada has been actively negotiating and reaching new FTAs with countries in Asia (such as South Korea, India, and Japan) and Europe (including the European Union and Ukraine). Compared with the United States, in general, Canada adopts more liberal rules of origin (RoO) for apparel products. Quite a few Canada FTAs allow companies to source yarns or even fabrics from anywhere in the world – with the finished products still enjoying duty-free treatment when exported to Canada. For the 87 categories of apparel that China was the top supplier, China’s average market shares reached 52.4%, 36 percentage points higher than the 2nd top suppliers for these categories. 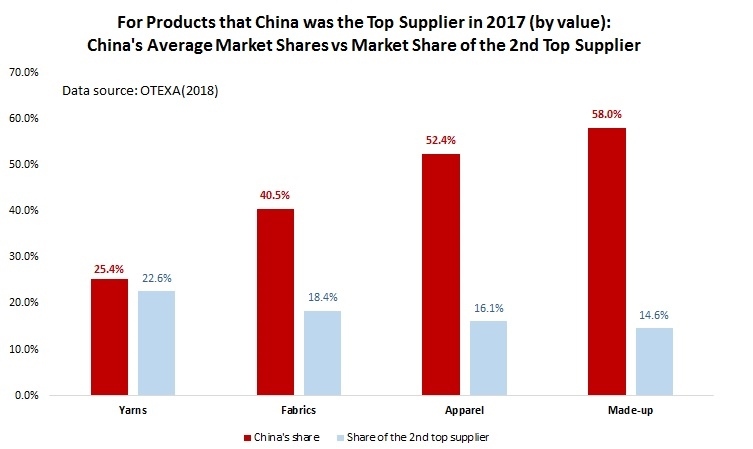 For the 11 categories of made-up textiles that China was the top supplier, China’s average market shares reached 58%, 43 percentage points higher than the 2nd top suppliers for these categories. Furthermore, T&A “Made in China” are demonstrating even bigger price competitiveness compared to other suppliers in the U.S. market. For example, in 2017, the unit price of apparel “Made China” was only 74% of the price of “Made in Vietnam” (in 2015 was 80%), 86% of “Made in Bangladesh” (in 2015 was 93%), 85% of “Made in Mexico” (in 2015 was 90%) and 86% of products by members of CAFTA-DR (in 2012 was 98%). Last but not least, the U.S.-China tariff war apparently has NOT affected China’s textile and apparel exports to the United States significantly. From January to August this year, China’s apparel exports to the U.S. declined by 1% in value and 0.3% in quantity from a year earlier, but China’s textile exports to the U.S. increased by 12.3% in value and 7.2% in quantity. China’s market shares in the U.S. market also remains overall stable. Are the results surprising? How to explain China’s increasing price competitiveness despite its reported rising labor cost? What’s your outlook for the future of China as a sourcing destination for U.S. fashion brands and retailers? Please feel free to share your views.